Exotic Sun City is unique in the world for its fabulous combination of features. Stunning Sun City gala functions both large and small, indoors or out are hosted year round. Formal or safari themed corporate banquets in Sun City can be held in a variety of settings from glamorous 5-star private dining rooms to atmospheric meals at a waterhole where Elephant come to drink.The resort is located at the edge of the malaria free Pilanesberg National Game Park just 187km / 116 miles from Johannesburg. The Sun City complex and Casino has 4 hotels, resort transport, entertainment for all ages, premier golfing, sports and spa facilities and first class gaming. Sun City shows and concerts are a major attraction at the Superbowl where thousands enjoy state-of-the-art technology and sound.Sun City has an amazing array of function venues. The sky is the limit. Shows, corporate banquets and gala functions in Sun City can be tailored to your exact requirements - conservative or adventurous, lavish or simplistic, the choice is yours. 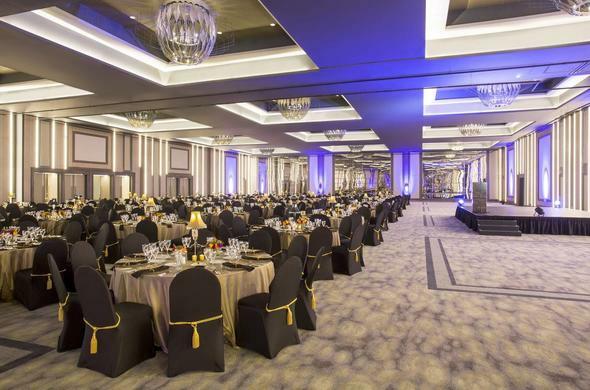 Each venue offers something of great appeal.Sun City gala functions can be held in the Royal Ballroom or Hall of Treasures which is also ideal for an exhibition. There are other options with wonderful views of the Royal Bath or Valley of Waves and an Amphitheatre for superb acoustics and magnificent torch lighting. The game park enclosures provide African bush meals around a camp fire and ethnic traditional dance displays.Guests can also enjoy unique corporate banquets in Sun City, South Africa, at the Cultural Village and Zulu Hut or be flown by helicopter to the Mountain of the Sun overlooking Sun City for an unforgettable lunch. The Palace of the Lost City is another sought after venue for truly exclusive functions. Guests here can relish opulent hand crafted decor, the finest service and cuisine as well as beautiful views.Apart from venues for shows, corporate banquets and gala functions in Sun City, this multi-purpose complex lends itself to extraordinary weddings and honeymoons for the bridal couple and exciting overnight packages for the guests. Wedding Banquet SetupCeremonies can be held at a number of indoor and outdoor venues including a boma (open-air enclosure) in the Game Park and the Wind Chime Chapel. The bride walks a pebbled lane to this enchanting African bush chapel to join her groom. This venue is situated on the Baobab Trail in the Lost City gardens, adjacent to the Lost City Golf Course. The rugged hills and dramatic architecture of The Palace of the Lost City make a spectacular backdrop for the wedding photography.Sun City receptions can take the form of a breakfast, lunch, dinner or tea and between 20 and 1500 guests can be accommodated. Everything is taken care of including the stationery and flowers, photography, seating plan and menus (with halaal, kosher and vegetarian options).